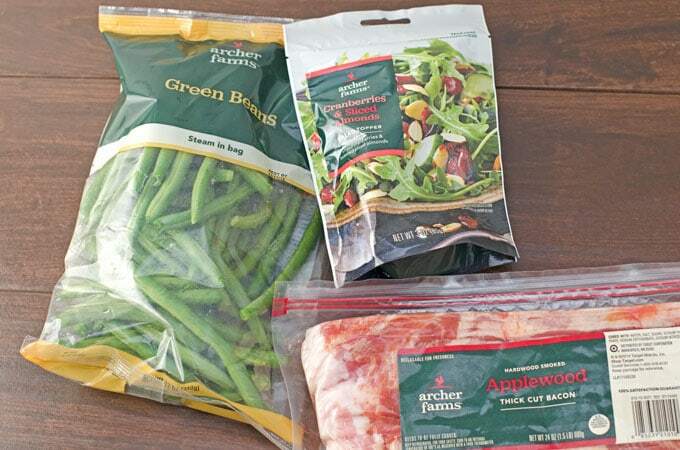 Do you get tired of boring plain green beans? 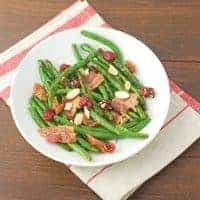 If so, you’ll love the flavor punch of this sauteed green beans with bacon, cranberries, and almonds recipe! 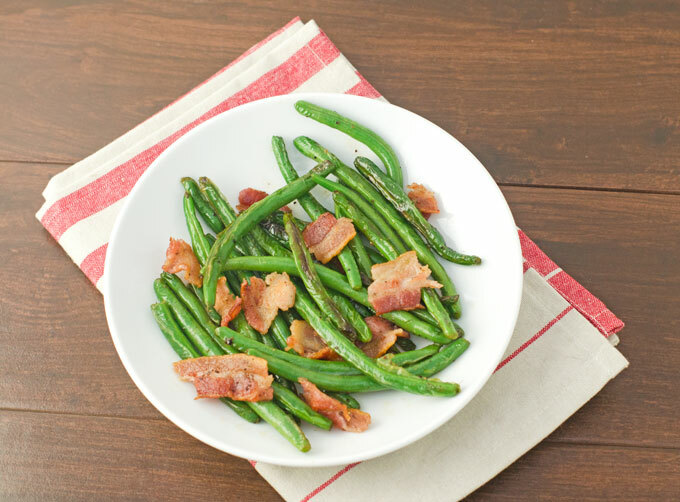 Green beans with bacon are delicious, but for Thanksgiving I like to kick up the flavor a bit. As a person that loves cooking and eating, I really enjoy this time of year. During the holidays, I make several dishes that I usually only serve just once or twice a year. You may think I might enjoy the desserts or turkey and ham most, but I actually really like to fill my plate with all the various side dishes. You’ve got the cornbread dressing, richer-than-usual mashed potatoes, sweet potato casserole, creamed corn, and, of course, these sauteed green beans with bacon, cranberries, and almonds. That may sound like a bit of a mouthful, but I promise it’s a delicious mouthful of savory flavors, too. Now, being from the south I know the deliciousness of canned green beans with bacon and onion that have been pretty much cooked to death and don’t look overly appetizing. While I love those, I have also seen the beauty of fresh green beans lightly sauteed so that they’re still crisp. You can, of course, used canned green beans, (or frozen, for that matter) in this recipe, but I really like the crispness of the fresh green beans. The bacon adds a ton of flavor that we all love while the cranberries add just a hint of sweetness and the almonds add a nutty crunch. Plus, the colors are just beautiful together this time of year. Here’s how I make them. 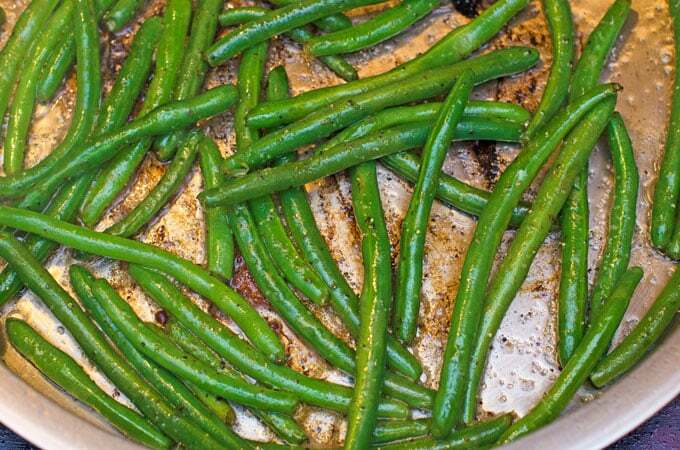 Do you get tired of boring plain green beans? 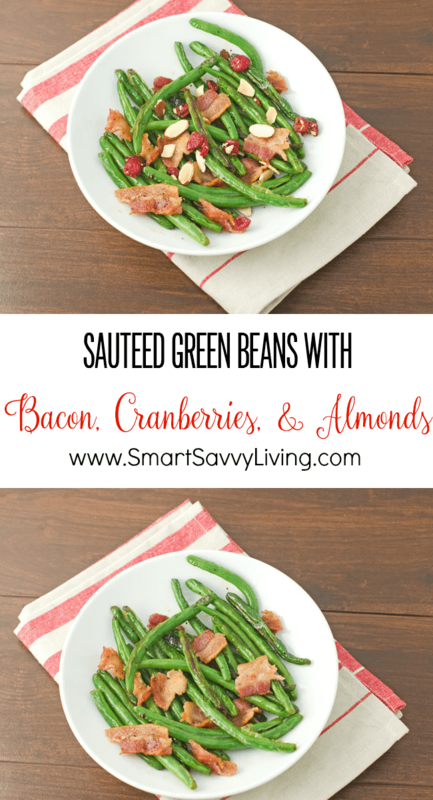 If so, you'll love the flavor punch of this sauteed green beans with bacon, cranberries, and almonds recipe! 1 3oz packet Archer Farms Cranberries & Sliced Almonds Salad Topper - Use as much as desired. I usually go with about half the package. In a large skillet over medium-low heat, cook the bacon until mostly crisp.When adding to green beans, I don't like to have it be super crisp, but you can, of course, cook it to your liking. Once bacon is cooked, remove it from the pan and place it on a plate lined with paper towel to absorb excess grease. Leave about 1 - 2 tablespoons of bacon fat in the pan. Sautee green beans in the bacon fat until crisp-tender, or your desired doneness, about 3 - 5 minutes. In the meantime, chop or crumble the bacon. Once green beans are cooked as desired, turn off the heat. Add the tablespoon of butter and bacon to the green beans. Salt and pepper to taste and then stir everything together. 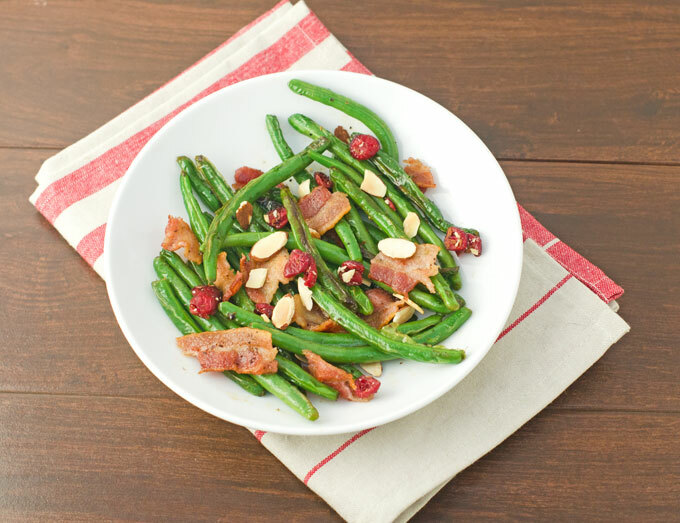 Place green beans in serving bowl and sprinkle with cranberries & sliced almonds. Serve immediately or cover with foil and keep in a warm oven until serving. These green beans are also delicious without the cranberries & nuts if you have guests that are allergic. I usually serve half without or keep the topping on the side just in case.